Buying or renting a home in 2018 is the best method to consider investing in a property that will convert into a money mine over years to come. If you are going through a financial crisis it would be better to rent a house but keep this option as the last choice or consider it as a temporary solution. 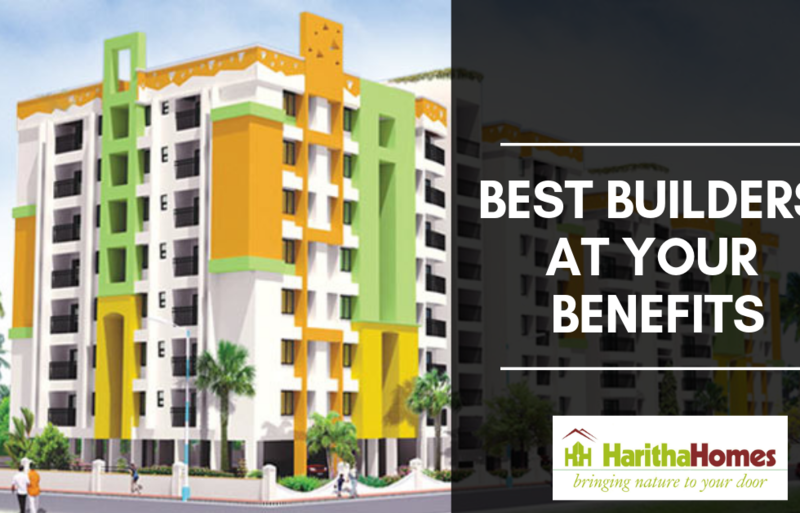 The real estate sector had a tremendous increase in the last two years and it seems that people are ready to invest any amount of money for buying their dream homes. We can never predict the future, who knows whether Apple will become more costly than buying a beautiful villa in Kerala. This blog will make you aware of the facts that you want to consider when buying a villa in Thrissur. Buying a home is not a cheap affair. It involves a lot of risks if this is your first time. 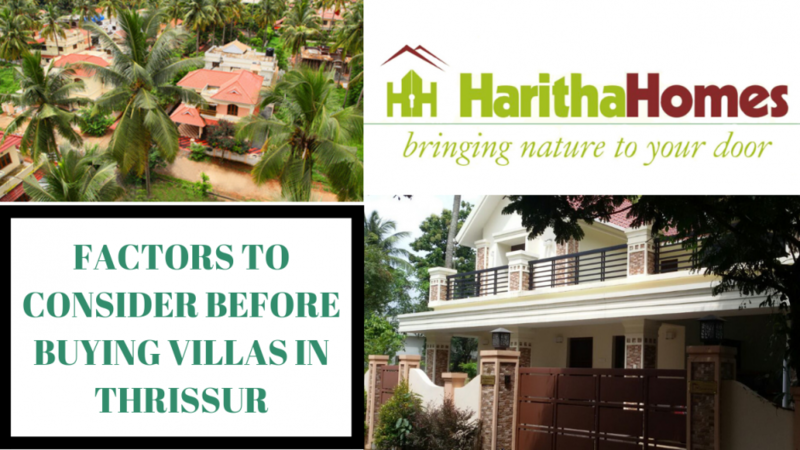 Here are some tips you need to consider before you start to search for villas in Thrissur town for sale. Does It Possess Enough Space To Live? What Does The Location Speak? Before you start with the homework you need to consider lots of things. Lots of research should be done if you are buying a home for the very first time. Location and space are the two basic things you need to consider under first priority when buying a home. Whether you are planning to buy a villa in Trichur or anywhere in Kerala first of all think of the place where you want to build your house. You need to take a decision depending upon the place where you want to live whether it is close to the bustle and hustle of the stewing city life or else you prefer a placid and calm life towards the edge of the city. Depending upon the location the price varies. The nightlife will be more live if you choose to buy villas in Kerala close to theaters and restaurants. Space is the next thing to consider while buying a villa. It is wise to choose a home which showcases lots of space inside. But the fact is that price and space is directly proportional to each other. When space increases price also shoots up. You can think of owning a spacious home if you ‘re not right on your budget. The rules and regulations set up by the lenders will be difficult for you to stand, so don’t take unnecessary risks to your first home for something that is difficult for you to abide by. Loans should be taken by considering a few factors like monthly income, pre-existing debts, about the status of your job etc. What Are The Additional Expenses? What is your concept about the consumptions that come across when you buy a home? Majority home buyers have a fake belief that there are no more expenses to be handled once their new apartment, flat or villa is theirs. If you are first time home buyer please note that it is not enough. There are a number of things that are to be taken into consideration. You need to think about the expenses to meet the interiors and the rest after buying a home. Even if you plan to do it yourself it will take lots of time, money, and effort. So it is advisable to choose someone from outside to help you with the interior decoration. The interiors and others are still pending even if you set a loan amount for your home. So consider additional expenses before applying for the loan. This is said so because you should save some money for leading a smooth life even after buying a villa and also keep a little nest-egg for emergencies. Get master to advise on the remodeling and interior expenditures and also get an appraisal price to settle whether you can afford these along with the payment for your homes. Location, as well as neighborhood, is very important. The majority give preference to buying a villa near their workplace but also consider the elements like hospitals, schools, shopping areas, banks, bus stops, restaurants etc while you plan to buy luxury apartments and villas in Trichur. Give importance to the neighborhood whether it is connected with good relations, is it away from the air as well as sound pollution. Because these factors have more importance on the resale value of your property at the time you plan to sell it. Inspect the water, electricity, and sewage connections to your property and ensure the all year round functionality. Make a point to inspect it beforehand before you decide to buy your dream house. Get to know about the condition of your house, where you will live with your family in the coming years. Don’t sleep with the nightmares of a roofing cracking open and falling off over to you are sleeping. Or don’t allow the bathroom pipes to drive you crazy while you try to fix these. Scrutinize the home for every minute details about its existing condition before getting into it. 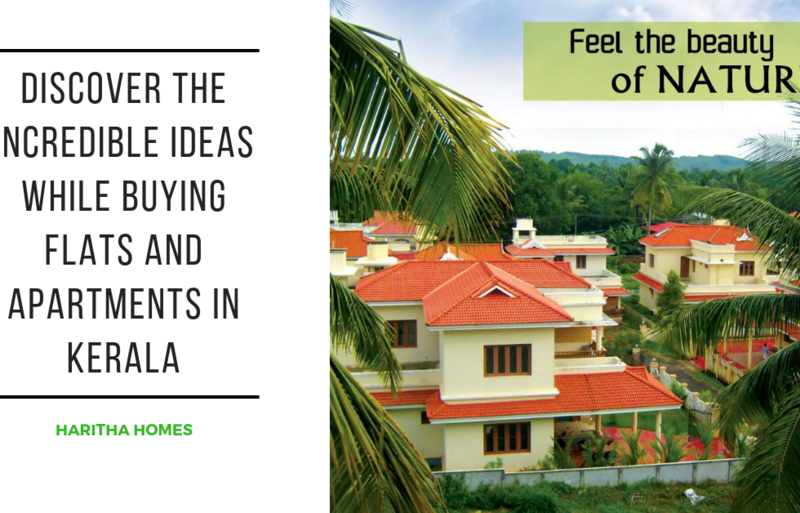 The money you invest today in buying premium villas in Thrissur will bring you a lot of value tomorrow. You are free to share your ideas and concepts to us. 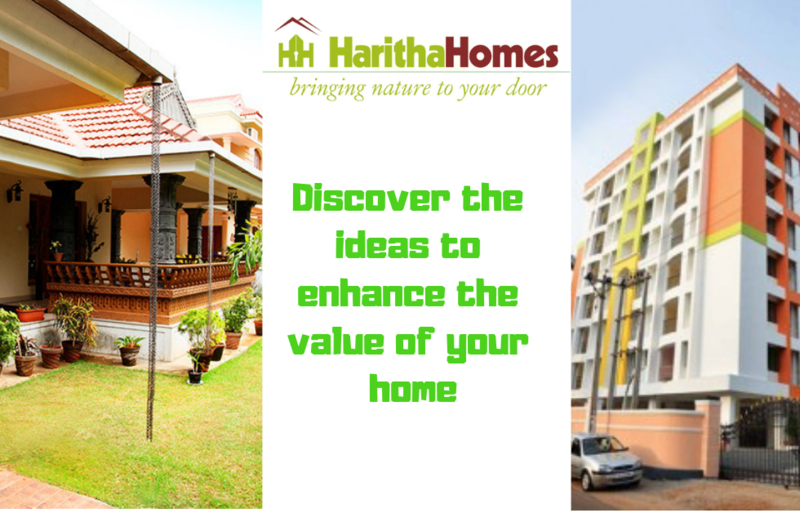 We, Haritha Homes offer ready to occupy villas and apartments in Thrissur. Since we follow a legacy of construction blend with nature followed by international standard of living we are unique from other Trichur builders. Our homes are different from one another in many ways and they are flooded with the facilities you have always dreamt off. Getting to know about the builders is very significant. Take a tour of their previous works. Compare the quality of their work with other professional builders. Ask them questions and clear all your doubts regarding the project before signing the dotted lines and check whether they have an apt answer to your questions. This all will help you to find a good builder for your home. 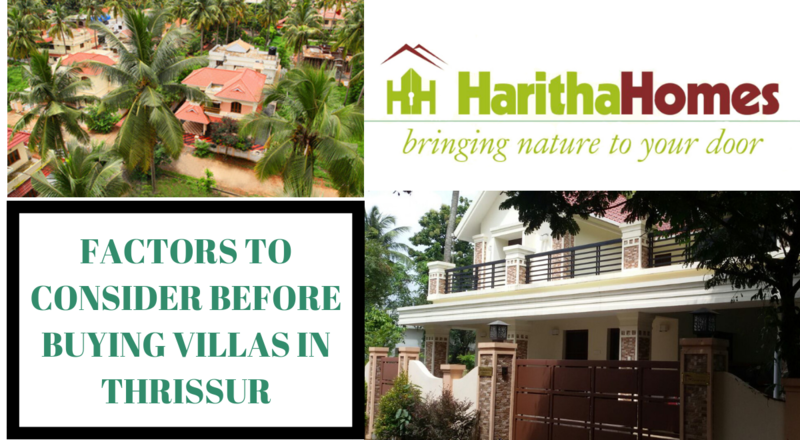 If you are planning to buy premium eco friendly villas in Thrissur, HARITHA HOMES is the ultimate solution. We have numerous ongoing villas in Thrissur and completed projects in Tcr. We are one of the number one villas, apartments and flats builders in Thrissur to aid you complete assistance on building your dream home. Feel free to contact us at Haritha Campus, Vadookara, Koorkenchery, Thrissur, +91 99 4699 9909. We expect to hear from you soon.